A Savvy Auntie Intern Has a New Nephew! I’ve suffered loss. When I was 19, a month shy of 20, my mother died. It was her heart. She would say she was like the Tin Man; she needed a new heart. But I didn’t take her seriously. I knew my mother had a bad heart; she had survived a heart attack at age 42, when I was 10. But she survived. And it was ten years later. And even when you’re 19, a month shy of 20, you don’t think your mother will die. But her heart broke at 52. And my heart was broken. And the closer I get to the age she was then, I want to hold her and tell her I know she is scared. But when you are 19, a month shy of 20, you don’t know what it feels like to be 52 and fearful you’ll die. And when you’re 48 and coming to grips with the fact that you didn’t believe your mother when she told you she was very ill and may soon be off to see a very different Wizard in a very different Land of Oz, you want to hold her. When you’re 48, you understand the mortality of a short life. And you understand now what they meant, her friends who were her age, about how young she was. Because when you’re 19, a month shy of 20, 52 is not nearly as young as it feels when you’re 48. I had a classmate who had lost her mother. We weren’t close, but she was kind enough to drop by the Shiva, the week of mourning after my mother’s funeral, with a letter that was part empathetic, and part “Welcome to the Club.” I want to say thank you again all these years later. I want to thank her because there were, thankfully, so few people who understood my grief and Amy took the time to let me know she understood. My brother and my father and my family and my closest friends and my other friends and the people you call a friend because you invited each other to your childhood birthday parties… they all tried to understand. My mother was my best friend, although I didn’t realize it at the time. She made me laugh. She made me cry. She made me angry. She made me clean up my room and do well in school and be kind to everyone. She made me feel safe and loved when others weren’t kind to me. Four years after we buried my mother, I left Montreal and moved to New York City where I knew just a few friends. And the longer I have lived here, the fewer friends know me as the daughter of a mother. It’s not that I don’t speak of my mother. It’s that I don’t speak to her and share the stories of what she said or what I said or what I can’t believe we said. I don’t mention that I can’t meet a friend on Sunday because my mother is coming to visit and we’re going to see a play or for a walk in Riverside Park or to just catch up on the things that need more than a phone call. I can’t share some lunch or dinner or dessert we made together when a friend drops by and tell my friend that my mother finally taught me how to make one of those dozens of things we used to make together. These were the things I've never made again. Because these were the things we made together. And no matter how close I could come, they would never taste the same as when we made them together. My niece makes my mother’s famous banana bread. She makes it because it was my mother’s famous banana bread. And she always saves a piece of banana bread for me for the next time I visit. Because my niece makes it for me. Because even though she has been making my mother's famous banana bread since she was old enough to use the oven with her own mother’s careful watch, she’s been making it to feel closer to the grandmother she never met. And my niece’s banana bread tastes exactly like the banana bread my mother would have made for me knowing I was missing her. And even though my niece was a girl, just shy of being a teen, she knew I still grieve my mother who died long before her father met her mother. Another niece and I share the same initials as my mother, her grandmother. And they share the same shade of kindness and sensitivity behind their big brown eyes. I tell all my nieces and my nephew about their grandmother. Only she was never a grandmother. She was a mother. She was my mother. And today, it’s 28 years, just shy of 29, since her heart broke and my heart was broken. And I thank God for the love I have found in my nieces and nephew who fill the void that can never be filled but can feel fulfilled. This is my modern loss. And Modern Loss is the name of a new book published today by Rebecca Soffer and Gabrielle Birkner, the founders of ModernLoss.com. I am sharing Modern Loss with you because even if you haven't had someone you love pass away, it’s likely you will one day. And if you have, you know the loss is always there. And just like my classmate dropped by the Shiva to give me the note to share her empathy and welcome me to the club, Modern Loss: Candid Conversation About Grief. Beginners Welcome is my note to you. I hope you don’t need it. I hope you never need it. But it’s likely you will. I am also sharing this book excerpt, written by Joey Chernila, who discovered a whole new side of his late Aunt Esther after her death: Meet Patricia, Aunt Esther’s Amazon Alter Ego - It was only after my aunt's death that I really got to know her -- through hundreds of Amazon.com product reviews. It’s a lovely, heartwarming story about how we get to know the ones we love in a different way once they’re gone. It’s funny and sweet and resonates with me. Thanks to my nephew and nieces, I have come to know my mother as a grandmother. She’s taught my niece how to make her famous banana bread to taste just like hers the way I never could. And she appears in the eyes of another niece whose initials she shares with her and with me. It makes me feel like my mother is here with us, again. And I refer to her as Bibi, the name my mother would have wanted to be called by her grandchildren. I don't call my mother by her name, Margaret. I rarely utter the word "Mummy" anymore. But Bibi is spoken of often. She is here in a lesson she taught me that I now teach my nieces and they remember the lesson and repeat it back to me because they cherish it as a gift from their Bibi - and they give the gift back to me by repeating it in her memory. Bibi is with us, in blessed memory, in a way I never knew her until her grandchildren were born. And my heart is a little less broken. 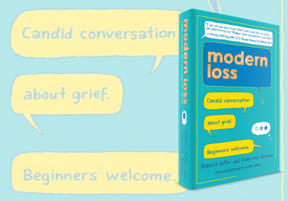 Learn more about Modern Loss, the book, here. Purchase the book here and anywhere books are sold.